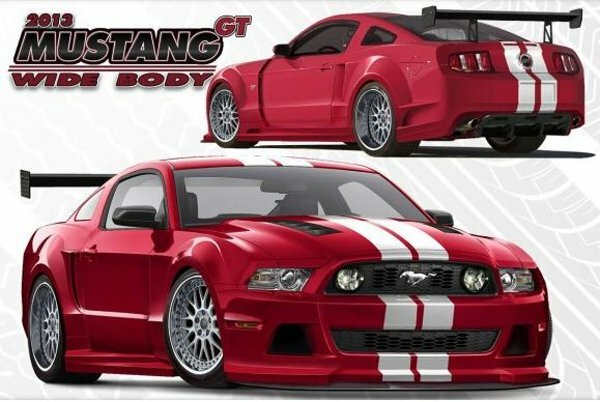 We can expect a seemingly endless collection of customized Ford Mustangs at next month’s SEMA Show in Las Vegas but today we have our first look at that collection as the folks at APR Performance have offered up artworking showing their custom 2013 Ford Mustang GT Wide Body. The APP Performance designed 2013 Ford Mustang GT looks like something that is ready to take on the world of Grand Am racing thanks to a long list of APR components beginning with a new 10 piece widebody package that widens the Mustang by about 2 inches on each side in addition to the aggressive front and rear fascia and the deeper side sills. APR has also pulled a huge rear spoiler, a front splitter and a rear diffuser (all made form carbon fiber composites) to complete the race car look. Creations N Chrome is mentioned as being a partner so we should expect some incredible, high quality finishes with product from BASF. After APR had given this 2013 Ford Mustang GT a menacingly wide stance, the wheel openings were filled with lightweight SSR wheels wrapped in Toyo Tires with StopTech brakes tucked behind the rims. To improve the output of this Mustang GT, a ProCharger centrifugal supercharger setup with a Magnaflow exhaust system should get the power up around the 600hp mark while some KW suspension components work with the tires and braking system improvements to make sure that this car handles as well as it accelerates and stops. An ACT clutch helps to safely and reliably put all of that power to the ground through the 6 speed manual transmission. Finally, the APR 2013 Ford Mustang GT Wide Body show car will feature seats and harnesses from Sparco along with a steering wheel from Takata. I also wouldn’t be surprised if this 2013 Mustang GT has an upgraded infotainment system in addition to some underhood dress up items – and possibly other unmentioned performance items – to make this car a fitting SEMA Show vehicle. To celebrate the fact that ProCharger is helping to make this Mustang feel like a race car just as much as it looks like one, this slick looking pony car will be displayed in the ProCharger booth at the 2013 SEMA Show. While the huge Grand Am rear wing might be a little much for the average 2013 Mustang GT owner, the artwork of this car looks great and if you don’t like the wing, pretend that it isnt there and you still have one sharp looking customized Ford Mustang.